Yes, dads deserve flowers too, but, 1800Flowers has more options than flowers just in case your husband/father/male figure in your life doesn’t want flowers. The bag is pretty nifty and will hold up to six bottles of water after you finish all of the snacks that come in the bag and keep them cool. I was enjoying all of the options in the Father’s Day collection so much that if I wasn’t on a diet I would order a few things for my husband. I know how much he loves sugar cookies and the Cheryl&Co.® Happy Father`s Day Cookie Tin look divine. The other option that really interested me was the Everyday is Sundae Ice Cream Lover Kit. I’m drooling over it so bad right now I’m going to have to go get some ice cream out of the freezer. 40.00 Gift Card to 1800Flowers. Tell me what your favorite item is from the Father’s Day collection. The contest will run until June 28th 11:59 pm Pacific. All rules can be found under giveaway rules. I love the Great Adirondack Breakfast Gift Basket because breakfast is my favorite meal of the day! I like the Father’s Day Deluxe Balsam Gift Basket. I like all the products, but I think I’ll have to choose the Faux leather trunks filled with treats as my favorite. I really like the Great Adirondack Breakfast Gift Basket! I follow 1800F on Twitter! I love the fishing creel – my dad would just love it! I love the Viansa Vineyards Wine Tasting pack. I like the Cheryl & co father’s day cookie tin. Thanks for the chance. I’m a Father, and I’d love to receive the Handsome Faux Leather Trunks with Treats. I’d also like the bing cherries–but I can go out to Kroger’s and buy them for myself. BTW, I follow @momstart from my @williamsdavidm account. Probably the Sauza® Tequila Grilling Steak Sauces Gift Set as my husband loves to barbecue. Thank you for the giveaway. I already follow 1800Flowers on Twitter (nanatide). Thank you. I follow via Google Friend Connect. Thank you. I love the Fishing Creel Full of Fisherman’s Favorite Snacks! This would be perfect for my dad or my husband! My hubby would really enjoy the Happy Father`s Day Candy Store Classics. My favorite is the Sweet & Savory Gourmet Snack Gift Basket. I like that it comes in four different sizes. My favorite is the Fishing Creel Full of Fisherman’s Favorite Snacks. My dad has taken up fishing now that he is semi retired. I love the Money Tree Plant! My husband would like the Happy Father`s Day Collectible Truck with Nuts. Thanks! I like Fishing Creel Full of Fisherman`s Favorite Snacks. $29.99 is awesome. My Dad would love it! I think the fisherman gift basket is my favorite one. My husband is REALLY into fishing right now. He might like to have some snacks out on the lake. I like the blood orange patio tree. I love the vintage glass jar with jumbo cashews! I left a comment at Wordless Wednesday – Mommy Moment post. My favorite is the Beer Mug of Blooms. Thanks. I just love the Fishing Creel Full of Fisherman`s Favorite Snacks! I love the Ball Player`s Best Big Ceramic Baseball Bowl! I follow 1800flowers n twitter! 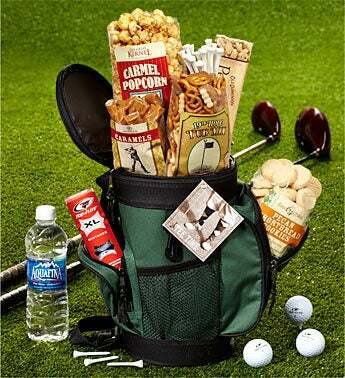 My favorite is definitely the Cool Golf Bag Cooler with Snacks! It is perfect for my husband! The Viansa Wine Tasting basket. I’ve actually been to that winery and loved it. One of my favorite items is the Great Adirondack Breakfast Gift Basket. Thanks for the review and giveaway! my dad would love it. I like the Father’s Day Budweiser Grilling Steak Sauces. I love the cooler bag…very cute! I love the fishing creel full of fisherman’s snacks! I know a lot of father’s who would love this! I’d love to get the Martha Stewart Sweet & Savory Snack Tray for my Dad. He’d really love this. Thanks so much. My husband would like the Beer Mug of Blooms. My favorite item from the Father’s Day collection is the Martha Stewart Sweet & Savory Snack Tray, my dad would love that! 🙂 Thank you. I like the Cheryl and Co cookie tin. I like the Beer Mug Full of Blooms. I like the Budweiser Grilling Steak Sauce set. It’d be perfect for my dad. I like the June’s Bonsai – Juniper with Golfball. I’d have to go with the Everyday is Sundae Ice Cream Lover Kit. My husband is an Ice Cream Addict. My favorite item is the Great Adirondack Breakfast Gift Basket . I like the Father`s Day Grand Meat & Cheese Gift Basket and I know my husband would too. I like the Sweet & Savory Gourmet Snack Gift Basket. Being originally from the Adirondack Mountains, I would definitely LOVE the Great Adirondack Breakfast Gift Basket. I like the “Orchard Fresh Fruit & Snacks Gift Basket”. He would love the margarita party basket. I love the Super Sweet Snack Gift Basket, wish I could get this for my husband, he would love it! I like the Super Sweet Snack Gift Basket! My favorite is the fresh fruit and candy gift basket. My favorite item is the Sweet & Savory Gourmet Snack Gift Basket. The Vintage Glass Jar with Jumbo Cashews. I am en email subscriber, thanks! My favorite item from the Father’s Day collection is the Orchard Fresh Fruit & Snacks Gift Basket. The Sweet & Savory Gourmet Snack Gift Basket is on the top of my list. I love the sweet and savory gourmet snack gift basket! I like the Blooming Dish Garden. The Orchard Fresh Fruit & Snacks Gift Basket is my favorite. I like the beer mug of blooms. My husband has a notorious sweet tooth, so his idea of a gift would be the Super Sweet Snack Gift Basket. My favorite item is the European Dish Garden. The Beer Mug of Blooms is hilarious! I love the Beer Mug of Blooms. I like the Bonsai with the golf ball. My favorite is the Beer Mug of Blooms! I would love to get the Orchard Fresh Fruit & Snacks Gift Basket, thanks! My favorite is the Extra Large Sweet & Savory Gourmet Snack Gift Basket! I really like the Sweet & Savory Gourmet Snack Gift Basket! the beer mug of blooms for hubby! I like the Beer Mug of Blooms™. I love the Super Sweet Snack Gift Basket! Mmmm. Following 1800 Flowers on Twitter (@KawaiiSplosion)! I’m following Mom Start on Twitter (@KawaiiSplosion)! I’m now following ya via GFC! My favorite gift is the Orchard Fresh Fruit & Snacks Gift Basket. Thanks for the giveaway! I love to send flowers to my mother-in-law. She is 80 years old. I like the green plant out of the Father’s Day Collection. The Super Sweet Snack Gift Basket is my favorite! The Super Sweet Snack Gift Basket: mmm, candy. nice assortments. would like to get a bouquet for my sweetheart’s grave. I like the Sweet & Savory Gourmet Snack Gift Basket the best. The Super Sweet Snack Gift Basket is my favorite. The Super Sweet Snack Gift Basket.